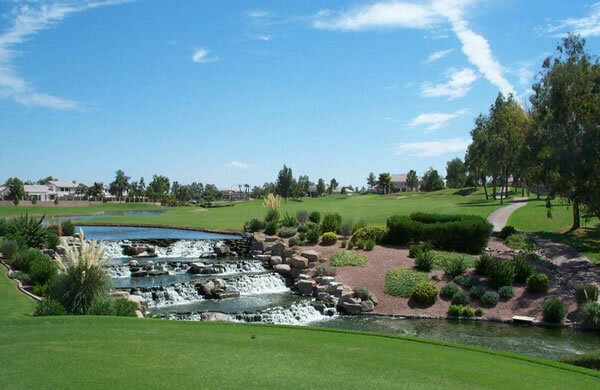 Ocotillo Golf Club is a 27-hole traditional design golf course with over 7 miles of shoreline, lakes and dazzling waterfalls. Designed by Ted Robinson, this course offers layouts such as the Blue, Gold and White. Blue is the shortest 9-hole course; however, is considered to be the most difficult and scenic due to the fact that water comes into play on almost every hole, the white course offers long Par 4s sure to test any golfer and the Gold is considered the easiest of the three; hosting less water on this course. Overall, water comes into play on 23 of the 27 holes. 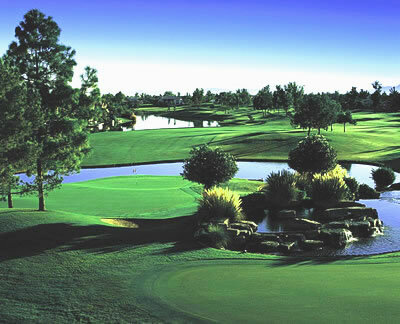 Strictly traditional, no desert landscaping or mountains appear in view from this course. Ocotillo is a great mix to add with other desert courses because it is a welcomed break from the rough, challenging desert terrain that most Arizona golf courses present. From Phoenix Sky Harbor: Follow the airport signs to the Loop 202 E. towards Tempe. Merge onto Loop 202 E. and continue 3.7 miles. Take the Loop 101 S. via exit # 9. Continue 8.7 miles and exit Price Rd. via exit # 61A. Turn right onto Dobson Rd. Turn left onto Ocotillo Rd. Turn left onto Clubhouse Dr. and follow signs to course.